Yes, absolutely. This is what was taught in the Foundation Diploma Course in the Cheirological Society. Your only addition here are the terms balanced and unbalanced - which are bad terms to use, obviously, as these are unquantifiable and entirely subjective in their provenance. People don't take notes properly; people misapprehend ideas slightly; those same people present those idea poorly and then write them down even more inaccurately. Then Martijn comes along and noticing the imprecision in what someone has said to him, spends many hours, days and weeks researching the topic to come back to what was taught in the first place ! It is such a shame that you never actually studied any elemental cheirology, then you would have saved yourself a lot of time! For example, one thing that you seem not to be aware of - but do correct me if I am wrong - the elemental handshape ascriptions used in the Cheirological Society were derived from meaurments of the handprint not the live hand ! 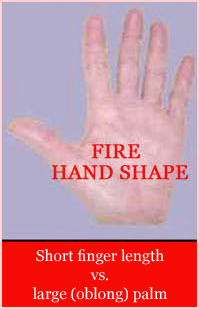 You also have to remember that the four element handshape classification you are referring to was just the Foundation Diploma level understanding. 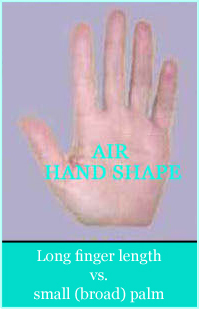 At the Lower Intermediate Diploma level, students were introduced to a seven-fold elemental handshape classification. At the Higher Intermediate Diploma level, students also needed to be familiar with the handshape classifications developed by Carus and Charlotte Wolff. And it was only at the Advanced Diploma level that we really considered the handshape classification systems used by Benham (who you fail to discuss) and D'Arpentigny. There is a lot more to it than you think! 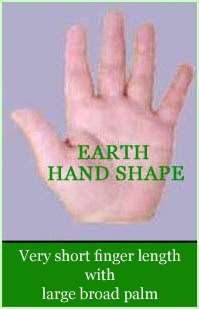 Christopher Jones wrote: For example, one thing that you seem not to be aware of - but do correct me if I am wrong - the elemental handshape ascriptions used in the Cheirological Society were derived from meaurments of the handprint not the live hand ! I have no memory of this fact!! Christopher Jones wrote: People don't take notes properly; people misapprehend ideas slightly; those same people present those idea poorly and then write them down even more inaccurately. oops, I guess I am guilty of that! Well, maybe this was never communicated explicit during those days??? Anyway... first of all: I am aware of the C.S. methods regarding the use of handprints, but I have never seen any evidence that the guidelines were never meant to be applied to 'live hands' - so maybe it is not really surprising that Lynn reported to be unaware of Christopher's claimed 'fact'... !!! Second, I also would like to point out to a different fact: the books of Terrence Dukes, Johnny Fincham and Jennifer Hirsch do not present any guidelines which suggest that hand shape assessment requires a hand print. 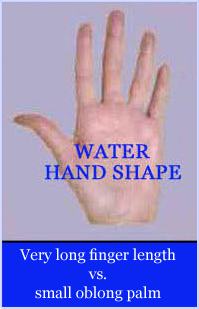 And also in Christopher's chapter "The Assessment of Handshapes" (Studies for Intermediate Diploma) there appears to be no reference at all regarding the difference between the live hand and a handprint; actually... there is not even a reference to handprints at all - so in this perspective maybe there are no students at all who have become aware of Christopher's claimed 'fact'!!!? Unfortunately, the fundamental differences between hand shape assessment via the 'live hand' and a 'hand print' never really became an issue in the fields of hand reading. But in my perception hand prints (read: ink prints) at best can only potentially present an accurate impression of the live hand shape, because hand prints never display the full hand contours (e.g. tips of the fingers are always missing, and I consider the proposed option to use a pencil to draw the outline as not much more than a speculative alternative - because the result will always directly depend on how the pencil is held). Therefore I think Christopher's suggestion that the C.S. guidelines were meant for handprints only ... can be recognized to represent an expression of irrationality - because in my perception his words quite sound like a claim that hand shape according the C.S. rules can only be assessed accurately through a hand print. But this would create kind of a silly situation... because that would add a huge dose of irrationality into the full system (which would implicate that the live hand is not good enough), and this might also explain why the issue was never raised explicit in the C.S. teachings. So at the end I think Christopher's criticism above is actually pointless, and I suspect he never even bothered to present any specified guideline describing the difference between 'live hands' and 'handprints' including the consequences regarding the criteria for the individual elemental hand shapes (in terms of for example the proportional formula for the fire hand shape: 7.5 - 8 -10, etc.). Actually, because of the potential errors in handprints... I think one actually NEEDS the 'live hand' in order to validate the accuracy of a hand print. For, by principle one should always be aware that hand prints can provide inaccurate impressions of the hand - not to speak of the issue regarding who made the handprint, because people also tend to develop their own rituals for making handprints, etc. And the chances are pretty high that hand prints display inaccuracies regarding hand shape assessment, because it depends on 3 variables: finger length, palm length & palm breadth... so one can wonder about the chance that all three variables present an accurate impression - maybe it would even take 'coincidence' (though this depends on what level of accuracy one is using... but that aspect was never really specified in terms of ratios, not even for the 4 basic hand types!). So I would like to dispute Christopher's objection regarding what I wrote about elemental hand shape assessment.